This first revision of the Moment of Truth core rule book fixes the discrepancies in the stat cost table and the example of play on the next page in the Character Generation section of the book. Also, a small clarification. While I don’t see it in the text, I’ve mentioned that players can exchange stat points for skill points at a 1:3 ratio. This causes problems, allowing character to max out their education at no cost. Thanks to Tappy for pointing out this loophole. While trait points can be used to purchase stat points (at 1:1) or skill points (at 1:3), this “exchange rate” cannot be used to convert skill points to stat points. I’m still plugging away on Blood, Blade and Tusk. Apart from a very mediocre novel I wrote in college, this is probably the largest writing project I’ve ever taken on. The main setting book, which details the history from 1000 a.d. to about 1200 a.d.; chapters on the Roman Church, Christendom in general and Orc culture; a very abbreviated survey of Europe; setting-specific rules (like skill lists, character archetypes, money and equipment); and lots of information about the Christian religion of the time. Border Lands, which details the area between Orc lands and the Kingdom of Germany, which is the default setting area. It details several cities and some notable NPCs the party may meet. Magic in Blood, Blade and Tusk. This has become a much larger text than I originally intended. It includes rules for magic (which I’m working on simplifying), as well as spell lists, details of various magical collegia and information about mage society. Also included in it is details of the various Realms of Existence, including the Natural Realm (the real world), the Fey Realm (and information about the Fey); the Celestial Realm, the Demonic Realm and the Infernal Realm. The latter sections are a direct result of the inclusion of summoning spells in the spell list (mages need entities to summon, after all). As a result of this work, mages can (in addition to casting “ordinary” spells) summon Entities for information or tasks. Adventures and Adversaries. This text (which I’ve only just started) will include some abbreviated mini adventures and people and creatures the party might encounter (including stat blocks). Demonic Magic. This text covers information about Fallen Angels, their ability to possess characters and their powerful, but dangerous, magic system. I’m anticipating this material to have a page count well over 100 pages. While I knew setting books would be much larger than the core rules, I didn’t anticipate this kind of scale. As such, and considering the amount of time I’m devoting to them, setting books will be much slower coming than I anticipated and won’t be freely distributed, unlike the core rules. The reason I’ve decided to concentrate on Blood, Blade and Tusk first is because of the interest in the setting from our Happy Jacks RPG Actual Plays. My favorite setting so far is Vast Dominions (think pre-WW1 era with space-faring dirigibles). While there are many early 20th Century steampunk settings, I think mine is very different. It includes rather sharp parody of Great Power colonialism of the time. It also includes information about the budding environmentalism/naturalist movement of the time, the occult dabbling of various clubs and societies and even the women’s suffrage movement. In many ways, this era was probably one of the most pivotal in human civilization, certainly Western Civilization. I feel this setting combines the daring-do spirit of the pre-WWI world, but has undertones of darkness and conflict in the social changes that started in this era. The other setting I’ve just started working on is Mobile Danger Force. This is a 1960s super spy setting (a la Mission Impossible — the series, not the movies). I’m running a game in this setting at Strategicon’s Gateway 2018 convention. This is the first time I’ve run it since a very early playtest years ago. I feel recent revisions of the rules would fit this setting very well. MDF is definitely a “pulpy” setting. It’s a setting where the Soviets are a wily villainous foil, but the United States is not quite the idealized hero they like to think they are. In addition to the settings I’m working on, there are several people working on other settings. I won’t detail them here, as what’s been told to me was in confidence, but I’m very excited what they come up with. Weltram Reich. This is a continuation of the Vast Dominions steampunk setting, but now it’s the 1930s and 1940s. The German great power has been seized by the Nazi Party, and the Third Reich is rampaging across the Solar System. This setting would include a far more black-and-white feel than Vast Dominions, obviously. But even with this clear delineation between good and evil, there are still very gray parts to it. Uncle Joe in the Soviet Union is technically an ally, but he’s also every bit as evil as his German counterpart. And the military-dominated Japanese Empire, while only a footnote in Vast Dominions, is a military force to be reckoned with. Eldemy. Those who’ve listened to my DnD campaign may recognize the Eldemy Setting. This is a far more traditional fantasy setting than Blood, Blade and Tusk. Over the course of several campaigns (most of which haven’t been recorded), I’ve developed a huge part of this campaign world. Then again, there are tons of great fantasy settings out there, so Eldemy is kind of on the back burner. Cosmic Horror. I’ve tried several times to come up with good, elegant fear and sanity rules for Moment of Truth, and recently, I think I figured them out. Originally, Moment of Truth was intended to be a Cosmic Horror game, with mind-shattering Cosmic Entities, and player characters fighting WAY over their weight class. If playtests for my fear and sanity rules work well, this setting will probably be moved up in the production schedule. I haven’t decided on an era yet, but I’m leaning toward modern day. This setting won’t include Lovecraftian entities, as that path is fraught with legal perils. Rather, I’ll come up with my own mythos. The is the final version of Moment of Truth core rules. The only revision from the previous final edition is that the gentleman who did the amazing job at laying the book out, Matt Leonard, added his names to the credits. Feel free to download it. Hope you enjoy it. If you wish to support my efforts to develop more for MoT, there will be a pay-what-you-want option on drivethrurpg. 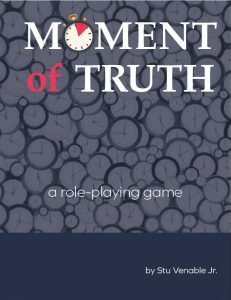 The link is: http://www.drivethrurpg.com/product/245115/Moment-of-Truth-RPG. As of this posting, the link isn’t yet public. I’ll post when it is. Happy Jacks host, Probie Tim, is working on a play-by-post vampire game using the Moment of Truth rules for a template. You can find it on the Happy Jacks RPG Podcast forum. Over at Warlock’s Sanctum, they’re developing a science fiction setting for Moment of Truth, called Prime Gates. I have several irons in the fire for the coming year to support the Moment of Truth RPG. Moments is a periodical I’m publishing to support MoT. The first two issues are written and edited. The first issue will be release with a pay-what-you-want version of the MoT core rules . Vast Dominions is an early 20th century “science” fiction setting. The space navies of the world’s great powers explore the solar system in dirigibles. It’s a world of unbridled expansionist colonialism. What if the crusades and the Norman invasion of Britain were curtailed by an invasion of France by thousands of war-hardened orcs? It’s a world of orc tribal politics, the Holy Roman Empire, the Inquisition, and you’re stuck in the middle. Arkendale is both a high fantasy setting for MoT and the setting for a scaled-down version of MoT for kids. The first playtests of Arkendale will be happening in the next two months. And glimpses of the setting (and expanded rules) will be previewed in Moments. Apart from my own efforts, there are no less that four other settings being developed for Moment of Truth right now. Moment of Truth started life about four years ago as the Drama, Tension, Conflict RPG. The game has changed quite a bit from those early days. There’s been a lot of playtesting, rewriting, starting from scratch. I’m happy with the game as it stands today. It has what I’m looking for in an RPG: simple, universal resolution mechanics, quick combat resolution, and the ability to be gritty or high-flying as a game system. One thing I did not expect when I first started developing the system was that, as I moved and tweaked mechanics, I realized GMs could do the exact same thing and make the game reinforce the campaign tone the GM is striving for. In addition, I introduced what I I think is a good solution for defense during combat, as well as a damage system that can be both forgiving and unforgiving. 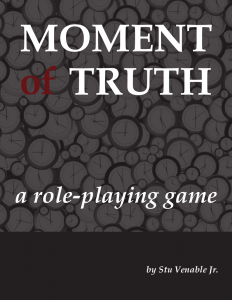 This is the main landing page for all things Moment of Truth, a table-top RPG by Stu Venable.